We have an EVEN BETTER Paleo Banana Bread Recipe that features in our Make Your Bread Paleo eBook! It’s easier and definitely more yum! Download it here! Who doesn’t love a slice of banana bread for afternoon tea? Often selected as it can be mistaken for a ‘healthy’ choice – apparently the word bread cleverly listed after the word banana makes it a healthy snack…because it’s fruit…and it’s bread…sooo it must be…ahh maybe not. Anyway, more like a cake, the banana bread you bought from the cafe this morning was probably over 50% sugar and defrosted from a freezer. Yuck! Well no more slaps on the wrist for indulging in your next slice, because we bring to you a paleo banana bread recipe that may just become a frequent flyer on your afternoon tea menu selection. This totally awesome flour can replace any plain or self-raising flour (just make sure you add two tsp of baking soda if you want the self-raising kind). 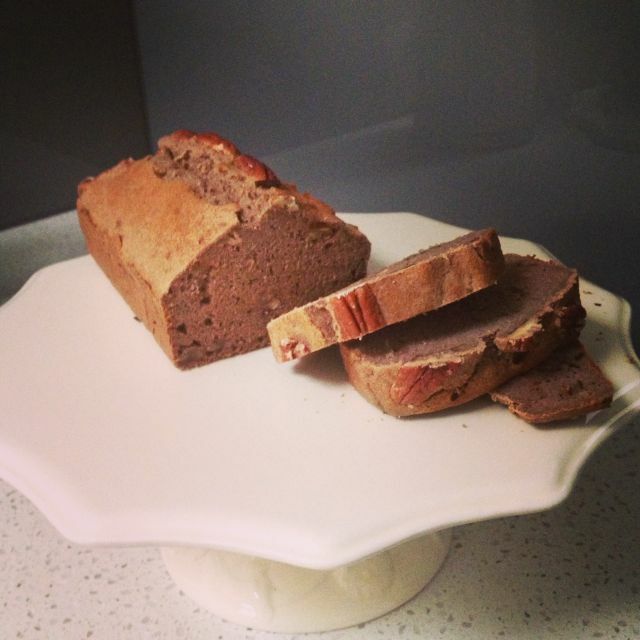 We had fun using our banana flour to give our paleo banana bread an extra nana-nutty flavour. So give this a try and say yes to your next slice of banana bread…cake…whatever you want to call it! Stick blend the bananas until they become a puree. Add the eggs, honey, vanilla and coconut oil. Continue to blend until combined. Stir through baking powder and cinnamon. Sift flour into the mixture, add the nuts and stir. Pour the mixture into a lined loaf tin (we used a 15 x 27cm). Sprinkle with cinnamon and place some nuts on the top of the bread. Bake in the oven for 30 minutes or until a skewer comes out clean. Let cool and turn onto a wire rack. Serve toasted with butter and fresh berries!